Palestinian President Mahmoud Abbas has said he will head a Palestinian unity government, after a second meeting with Hamas leader Khaled Meshaal. The interim government is to prepare polls in the West Bank and Gaza Strip. Mr Abbas and Mr Meshaal have been holding talks in Qatar over a reconciliation deal reached in April 2011 and who would head the government. Correspondents say the issue has been one of the main stumbling blocks to implementing the agreement. The April deal sought to end more than four years of separate governments in the Hamas-run Gaza Strip and the West Bank - areas of which are governed by Mr Abbas's Western-backed Palestinian Authority. Israeli Prime Minister Benjamin Netanyahu criticised Mr Abbas's announcement, saying he had chosen to "abandon the way of peace" in reaching a power-sharing deal with Hamas. Last month Israel and the Palestinian Authority held their first talks in more than a year, without making any apparent progress. 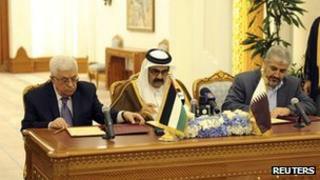 The line-up of the government will be announced on 18 February in Cairo, a Fatah official told the AFP news agency. The government will be made up of technocrats and independents, reports say. Mr Abbas says the two sides are serious about political unity. For months, Fatah and Hamas have been trying to decide on the name of a new prime minister. That person was supposed to be an independent figure. But after failing to agree, they have come up with what many will see as something of a fudge. Mahmoud Abbas will now serve as both president and prime minister. Many Palestinians will be unclear about how that will work in practice. Mr Abbas leads the Fatah movement and Hamas had previously rejected the idea. Mr Abbas says he will form a new unity government to prepare for elections in Gaza and the West Bank later in the year. He said the two sides were serious about political unity. But the fact it took so long to make this decision reflects ongoing serious divisions between the two sides. Israel and the US, which regard Hamas a terrorist organisation, are strongly against Palestinian reconciliation. But the fact Mr Abbas is pushing ahead anyway indicates his frustration with US mediated peace talks with Israel which have seen little if any progress for more than a year. As part of the agreement in April, an interim unity government was to prepare for presidential and parliamentary elections. But Hamas strongly opposed Mr Abbas's initial choice of Salam Fayyad, the current prime minister of the Palestinian Authority in the West Bank. The elections were expected to be held in May, but the Palestinian election commission says more time will be needed, Reuters news agency reports. The BBC's correspondent in the West Bank, Jon Donnison, says there have been plenty of false dawns for Palestinian political reconciliation and people here will want to see if unity works in practice, not just on paper. There remain serious differences in policy not least, how to deal with Isreael, he adds. Fatah has historically been the dominant faction in the Palestinian national movement, but in January 2006 the Islamist militant movement Hamas won Palestinian Authority legislative elections. The government subsequently sworn in was widely boycotted by the international community. In early 2007 Fatah and Hamas agreed to form coalition to end growing factional warfare. In June of that year Hamas seized control of Gaza by force. Gaza and the West Bank came under separate government, and Israel and Egypt tightened the blockade on Gaza. Israel opposes the formation of a Palestinian unity government. It views Hamas as a terrorist organisation. The Middle East Quartet of the United States, Russia, European Union and United Nations insists Hamas should renounce violence, recognise Israel and back past Israeli-Palestinian agreements before a Palestinian unity government can be recognised.